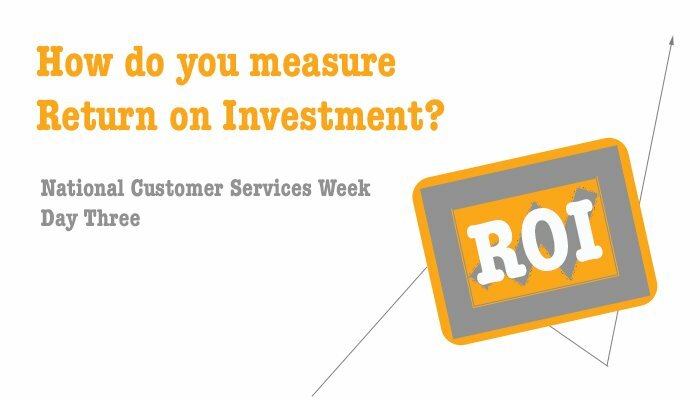 It is National Customer Services Week #NCSW2015 – Day 3 was about Return on Investment. Here is our article from yesterday all about the importance of measuring customer experience and financial performance. There are only two ways to improve profits – reduce costs or grow revenues. After many years of downsizing and restructuring companies are running out of opportunities to reduce costs and – particularly as the economy picks up – are turning their attention to how they can grow their top line. So, what customer measures should we track? Customer satisfaction is not a good predictor of revenue growth. In recent research it was reported that 57% of customers who switched expressed satisfaction with their previous supplier. If customer satisfaction is not a good predictor of revenue growth, what is? Advocacy – the extent to which customers are such ‘fans’ of a brand that they recommend it to friends and colleagues – does drive customer behaviour in the form of loyalty and increased spend in the way that satisfaction does not. In his famous HBR article ‘The one number you need to grow’ Frederick Reichheld argued that the only measure of performance that really matters is the ‘Net Promoter’ score. The net promoter score is calculated by taking the share of customer ‘promoters’ or advocates – respondents highly likely to recommend (scoring 9-10), and subtracting the share of customers who are detractors (scoring 0-6). Dr Paul Marsden from the London School of Economics reported (in Advocacy Drives Growth) that there were two key predictors of revenue growth – word of mouth referral as measured by the Net Promoter Score (NPS) and negative word of mouth. Marsden goes onto say that whilst creating advocates is critically important, eliminating negative word of mouth has an even greater impact on revenues. The problem with just asking just one question – the recommend question – is that it does not tell the company what it should do in order to improve its NPS. For those organisations wishing to drive down sales and marketing costs and increase revenues, a strategy focused on increasing the percentage of advocates in its customer base is the way to go. That does not mean the net promoter is the only measurement tool to use. Understanding the value your organisation is delivering to target customers is usually best served by tracking customer satisfaction, Net Promoter and Customer Effort Score in order to figure out how to create more value for your customers and thereby increase their loyalty and trust in your brand. Only then will these loyal and highly profitable customers be prepared to recommend your organisation to others.